Here at ChiIL Live Shows, we've seen many versions of Strindberg's Miss Julie over the years, yet none quite like this. I'm eager to check out Victory Gardens' take on Yaël Farber’s modern, post apartheid South Africa based adaptation. 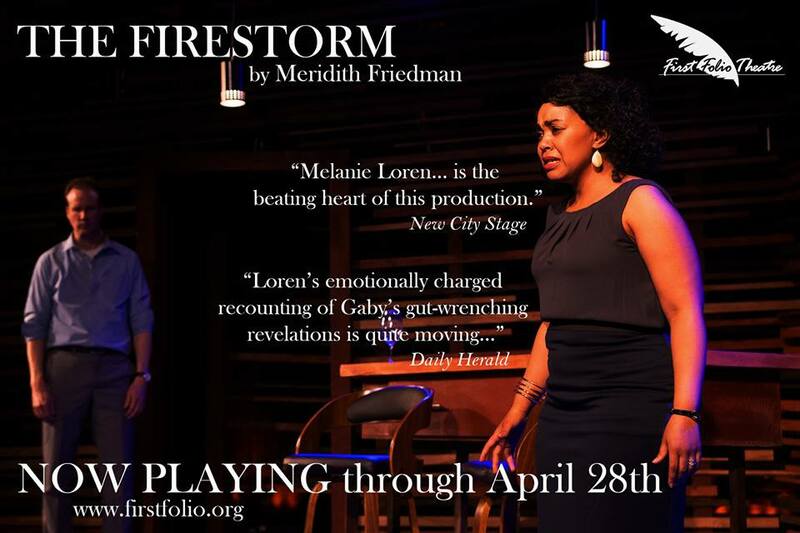 Set in a remote South African desert, playwright Yaël Farber’s award-winning adaptation of August Strindberg's classic Miss Julie has never "raged quite so fiercely," (The Guardian). It is Freedom Day, 18 years after the end of apartheid. A farm laborer John encounters his white Afrikaans master's daughter, Julie, on a feverish night fueled by heat, primal passion, and generation-deep resentment. The visceral struggles of contemporary South African society are revealed as a deadly attraction spirals violently out of control. 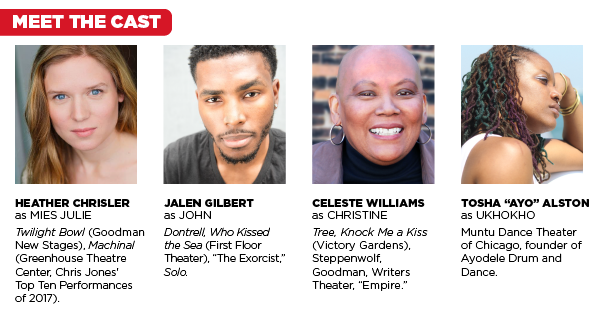 The cast of Mies Julie includes Tosha 'Ayo' Alston (Ukhokho), Heather Chrisler (Mies Julie), Jalen Gilbert (John) and Celeste Williams (Christine). The creative team includes Kurtis Boetcher (scenic design), Raquel Adorno (costume design), Diane B. Fairchild (lighting design), Stephen Ptacek (sound design) and Eleanor Kahn (props). For this production of Mies Julie Phillip Timberlake serves as the dialect coach and Kristina Fluty is the intimacy and violence choreographer. Carol Ann Tan is the assistant director, Jessica Forella is the production stage manager and Skyler Gray is the dramaturg. DEXTER BULLARD (Director) is happy to be back at Victory Gardens after directing Roy WIlliams' Sucker Punch and Annie Baker’s Circle Mirror Transformation. Recent credits include Tracy Letts’ Linda Vista and Annie Baker’s The Flick at Steppenwolf, Craig Wright's Grace on Broadway, the world premiere of Dan LeFranc's The Big Meal at American Theatre Company, Odradek at The HOUSE Theatre, Mistakes Were Made at Barrow Street Theater Off-Broadway and with A Red Orchid Theatre, Reverie with Second City at The Just For Laughs Festival in Montreal, Lady at Rattlestick Playwrights Theatre Off-Broadway, and Gas for Less at the Goodman Theatre. In 2004, Dexter was awarded the Lucille Lortel Award for Tracy Letts’ Bug at The Barrow Street Theater, as well as a Drama Desk Nomination. 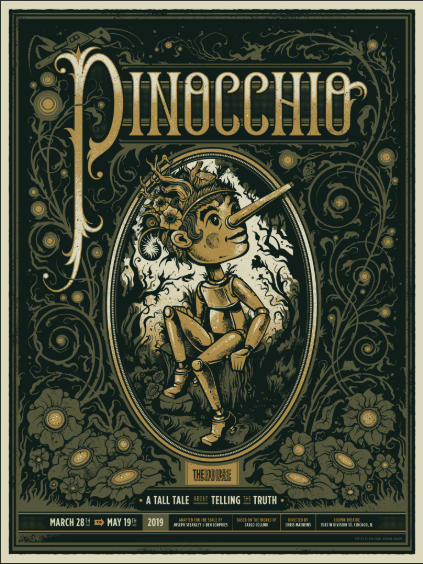 In 1995 Dexter co–founded Plasticene, a physical theater company whose critically–acclaimed experimental works were featured at The Steppenwolf Studio, The Edinburgh Fringe Festival, The Storefront Theatre, Performing Arts Chicago, MCA, and in New York City. With the Plasticene company, he directed and collaboratively created sixteen original works over seventeen years including The Palmer Raids (2003.) Since 1996, Dexter has directed with The Second City, leading a National Touring Company and developing satirical revues at E.T.C. and at Second City Detroit. Back in 1990, Dexter founded The Next Lab at The Next Theatre where he directed Bouncers, for which he received a Jefferson Citation and an After Dark award for his direction. At Next Theatre, he directed and/or created eight shows for mainstage and Lab as well as producing the world premiere of Tracy Letts’ Killer Joe. He has also directed projects for Famous Door Theatre, Northlight Theatre, Hartford Stage Company, Manhattan Theatre Club, Links Hall, and several times for A Red Orchid Theatre. Dexter received his undergraduate degree from Northwestern, his MFA in Performance from School of the Art Institute of Chicago, and is the Head of Graduate Acting at The Theatre School at DePaul University. YAËL FARBER (Playwright) is a multiple award-winning director and playwright of international acclaim. Her productions have toured the world extensively - earning her a reputation for hard-hitting, controversial works of the highest artistic standard. She has most recently directed a highly acclaimed production of Loraine Hansberry’s unfinished final work Les Blancs for the National Theatre in London. Her recent production of Salomé (written and directed by Farber) for Washington’s Shakespeare Theater Company was received powerfully by the press, was nominated for 10 and won 7 Helen Hayes Awards - including Best Director and Best Play 2015. Her award-winning production of Arthur Miller’s The Crucible for the Old Vic at London’s West End garnered ten 5-star reviews from UK’s top publications, and a rave review from The New York Times. The production earned her a London Evening Standard nomination and an Olivier Nomination, and is one of the most successful productions in The Old Vic’s illustrious history. A film of the production, captured by Digital Theatre, sold out in theatres for limited runs around the world. 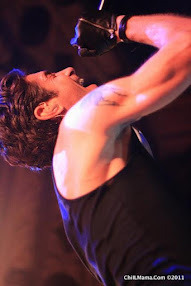 Nirbhaya (directed and written by Farber in India 2013) earned exceptional reviews and three international awards at the 2013 Edinburgh Festival. Mies Julie (written and directed by Farber) won a string of international awards at the Edinburgh Festival 2012 and was named one of the Top Ten Productions of 2012 by The New York Times, and Top Five Productions of 2012 by The Guardian. A selection of her awards include: BroadwayWorld Best Director (2014); Asian Media Award (2014); The Amnesty Freedom of Expression Award (2013); Best of Edinburgh Award (2012); Scotsman Fringe First Awards (2000, 2012, 2013); Herald Angel Awards (2003, 2012, 2013); South Africa’s Fleur du Cap (2012), Vita (1991) and Naledi Awards (2002, 2008, 2013); Boston’s Elliot Norton Award (2013); Canada’s Dora Mavor Moore Award (2014) and a BBC Sony Award (2001). She was named Artist of the Year in her native South Africa (2003). Ms. Farber was named amongst the top 100 South Africans by Citypress in 2013. Her plays are published by Oberon Books (London, UK). Her productions have toured across the major cities of the USA, the UK, Africa, Canada, Australia, Japan, Europe, India, United Arab Emirates, Singapore and Hong Kong. She has been an invitee at the Lincoln Center Theater Directors Lab (NYC), a guest artist at Mabou Mines Theatre Company (NYC), Haus der Kulturen der Welt (Berlin), The Public Theater (NYC) and the Sundance Institute Theatre Lab (Utah). She served as Head of the Directing Program at the National Theatre School of Canada between 2009 and 2012. Ms. Farber was named amongst the top 100 South Africans by Citypress in 2013. Her plays are published by OBERON BOOKS (London, UK). TOSHA 'AYO' ALSTON (Ukhokho) is a quintessential Brooklynite and was raised in a family of highly skilled artists and musicians. Ayo served as Dance Captain for Muntu Dance Theatre of Chicago. In 2009, Ayo birthed Ayodele Drum and Dance; a teaching organization created for women to affirm their self-confidence and strength in our communities. Ayodele personalizes African music and dance in order to effectively infuse our children with cultural wealth. Ayohas and continues to share her growing knowledge of traditional and contemporary African and African diaspora dance and music forms across the country. She is a level 1 ASA fitness instructor. Ayo currently teaches at Columbia College at Chicago and Chicago High School for the Arts. HEATHER CHRISLER (Mies Julie) makes her Victory Gardens debut. Chicago credits include Twilight Bowl (Goodman, New Stages), Machinal (Greenhouse Theatre Center, Chris Jones' Top Ten Performances of 2017), Mary's Wedding, Captain Blood, The Madness of Edgar Allan Poe (First Folio Theatre), Her Majesty's Will (Lifeline Theatre), good friday (Oracle Productions, Jeff Award Nomination Best Ensemble), and All's Well That Ends Well (Stage Left). Regional credits include Dancing Lessons (Riverside Theatre), Romeo and Juliet, Tempest (Door Shakespeare), Christmas Carol, The Three Musketeers (Cincinnati Playhouse in the Park), Much Ado About Nothing, and Blithe Spirit (Monomoy Theatre). She has appeared on TV in Chicago P.D. and holds a MFA from Ohio University. JALEN GILBERT (John) has appeared in Dontrell, Who Kissed the Sea (First Floor Theater), Paradise Blue (Timeline Theatre (u/s), and East Texas Hot Links (Writers Theatre(u/s). His Film & TV credits include The Exorcist, Medicine, and Solo. CELESTE WILLIAMS (Christine) has previously appeared at Victory Gardens in Tree, Knock Me a Kiss, Emma’s Child, and Pecong. Other theatre credits include Goodman Theatre, Steppenwolf Theatre, Northlight Theatre, Writers’ Theatre, Court Theatre, Next Theatre, Milwaukee Repertory Theatre, and Clarence Brown Theatre. Film and TV credits include Rose White, Boss, and Empire. Previews for Mies Julie are May 25 – 31, 2018. Previews are $15-$45. The Press opening is Friday, June 1 at 7:30pm. Regular performances run June 2 – 24, 2018: Tuesday – Friday at 7:30pm; Saturday at 3pm and 7:30pm; Sunday at 3pm. Regular performances are $15-$60. 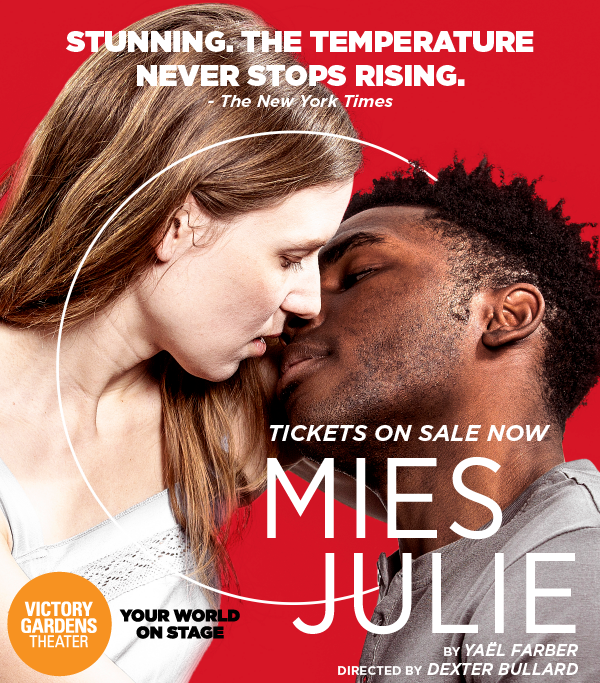 Victory Gardens has partnered with mobile theater ticketing app TodayTix to offer free tickets for the first preview of Mies Julie. Free Tickets will be available via TodayTix mobile lottery, launching one week before the first preview on Friday, May 18, 2018. Winners will be notified by email and push notification between 12:00pm and 3:00pm on the day of the first preview, Friday, May 25, 2018. To enter, download the TodayTix app on your iOS or Android device.